The Snappers were represented well once again in the SFCBL All Star game this season. The team sent 7 players this season with 5 position guys and 2 pitchers getting invites to the game. "Pitchers Jonathan Ripoll and Chris Jordan have been the two aces for us all summer. So it was good to see them get the opportunity they deserved out there today," said GM Ryan Lamb. Both guys made short work of the batters faced as they threw scoreless 3 up 3 down innings. Chris Jordan ended the season leading the league in wins with 6 while Ripoll was among the league leaders in strikeouts all summer long finishing with 42. West Boca was represented well in the field highlighted by SS Francisco Urbaez from Chipola College who got the start for the South team. He was accompanied by fellow infielder from Davis & Elkins College Hunter Thomas. The Snappers also sent outfielders Dan Blazejewski and Jared McKay who both run sub 6.5 60 times. 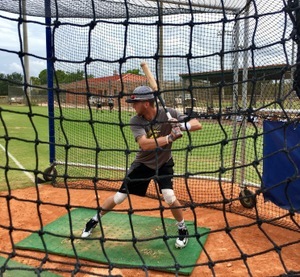 "McKay from the University of New Orleans is hitting just under .300 on the summer but has plus plus speed and has made highlight after highlight reel plays for us this summer," said head coach Ross Smith. Blazejewski has plus power with 2 home runs on the summer also made a spectacular catch in the game. Luis Aviles an incoming catcher at Rice University rounds out the All Star lineup for the Snappers. He has been in the middle of the lineup all summer and really been able to adjust to the level of competition hitting just over .300 for us. Snappers GM Ryan Lamb went on to say " These have been our key guys all summer and were going to lean on them down the stretch as we make our playoff push."